When it comes to DLC, new content for games we love can be hit or miss, depending on how devs and publishers handle them. Some charge too much for simple additions, whereas others charge next to nothing and give you the whole world in the process. The best case of paid DLC done right though, is with Xenoblade Chronicles 2. Monolith Soft is doing a Santa Claus impression and handing out presents left, right and centre and we still haven’t seen everything as the biggest gift of them all (Torna – The Golden Country,) won’t even be out until September 2018. While some would rather her and possibly Cappy, appear as playable characters in Super Mario Odyssey, honestly, I’d rather she strengthens her Nintendo Switch appearance, by making a splash in the second best-selling Switch game of all time. As Mario’s first love interest, Pauline is one of, if not the most important feminine character, as far as the whole Mario IP is concerned and what’s more, if Mario and Bowser can find the time to stop being enemies and race one another, Pauline can easily walk away from her Mayoral duties for a short time. She wouldn’t even need to be added as an entirely new character either, as like with Link, who now has the Champion’s Tunic (Breath of the Wild) Link, available as an alternative skin, Pauline could be added as an alternate skin for Rosalina. It wouldn’t take a lot of doing to have it happen and it is certainly something long-time Mario fans would enjoy. Those I’ve already shared the idea with, have voiced nothing but agreement. Sadly though, although this is the thing I’d love to have happen the most, it’s also the least likely one to come to fruition, but a guy can dream right? With more updates coming to Mario Kart 8 Deluxe, why not an update of this particular scale? In Xenoblade Chronicles 2, Blades aren’t just a means to battle monsters and Drivers, but they’re life forms with personalities and their own opinions and thoughts. They’re also some of the best characters in the game, with the likes of Pyra, Pandoria and Poppi being downright memorable. They’re not the only ones mind you, all of the Blades leave quite the impression, only, even though we’re still getting new Blades, such as Crossette, I can’t help but wish Fi and/or Ghirahim from The Legend of Zelda: Skyward Sword. With the likes of Rex’s Salvager suit appearing as a free costume in Breath of the Wild, why not have a touch of Zelda in Xenoblade? While himself as a Blade would be weird as well, Fi and/or Ghirahim would make a lot of sense. Fi is the Spirit of the Goddess/Master Sword and Ghriahim is pretty much evil version of her and is none other than the Demon King Demise’s sword. Both characters are pretty much Blades and act very much like Blades, but they even have crystals of their own, which match those that are present on the swords wielded by Link and Demise. Fi’s crystal is blue and resides on her chest, whereas Ghirahim’s is red and worn around his hip. So, it’s not they’re designs would even have to be adapted all that much as they are pretty Blade-like in their current state. I highly doubt we would get one of them, let alone the two of them, but you can’t deny they’re inclusion wouldn’t be awesome and a great way to promote a possible HD release of Skyward Sword for Switch. Although we have already covered one possible Zelda appearance in Xenoblade Chronicles 2, there is another I wish to bring up, the Champion’s Tunic from Breath of the Wild. With Link’s new iconic blue garb appearing in games such as Miitomo, Skyrim, Hyrule Warriors: Definitive Edition, Mario Kart 8 Deluxe and more, why not have it appear in Xenoblade Chronicles 2 as well? With new costumes available for various characters in Xenoblade Chronicles 2, for those who have the Expansion Pass, it’s not like Rex being able to wear something else, would be different too different. It will still be Rex, just a different shirt. 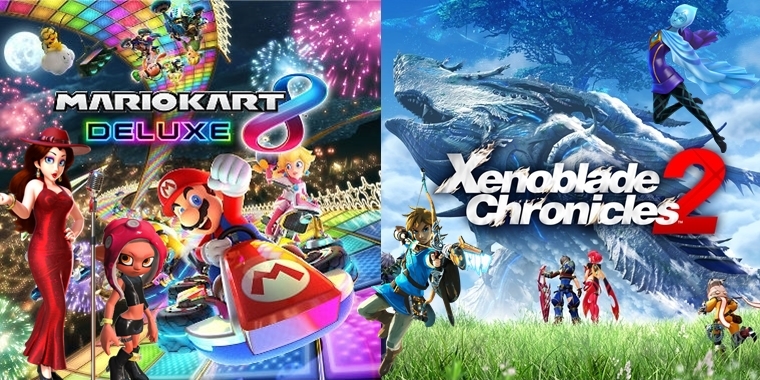 After all, Monolith Soft staff members did help out with Breath of the Wild, so for them to want to do something to pay homage to another game they were involved with, it would be most understandable and not to mention, completely bad arse. Returning back to Mario Kart 8 Deluxe, while Pauline is my first choice for an alt skin character being added, it would be remiss of me if I did not express a desire to see Octolings added as well. They may not have won their Splatfest against Inklings, but they were the team that proved the most popular, so that’s got to count for something! Seriously though, they are a cool character and if it wasn’t for the paid Octo Expansion DLC that arrived in June, we would never have got the chance to play them in an official capacity. Also, due to their similarities to Inklings anyway and the fact there are plenty of assets for them, it should take very minimal effort to add them in as an alt skin for the Inkling characters. This move wouldn’t just draw more Splatoon fans to Mario Kart 8 Deluxe, but it could just be the prompt that makes more Mario Kart 8 Deluxe players, pick up Splatoon 2 and the Octo Expansion DLC. Not that either game needs the boost as both are selling fantastically, but it would be an awesome addition nonetheless and out of everything I have listed above, is also the most likely! Anyhow, those are my ideas for more DLC content. Thank you for taking the time to read them and if you feel up to it, you’re welcome to leave an idea or two of your own in the comments, I’d be happy to read them. Every now and then, Nintendo fangirls and fanboys do get their dreams to come true. We are getting Smash Bros and Pokémon this year after all!